Is My Husky Puppy's Weight Normal? / Is My Husky Puppy’s Weight Normal? Is My Husky Puppy’s Weight Normal? The adult weight of a Siberian Husky is typically 45 to 60 pounds (20 to 27kg) for males, and 35 and 50 pounds (16 to 23kg) for females. That's the AKC standard for the breed. But what about a growing Husky? How do you know if your puppy is underweight, overweight, or just right? By 12 months of age the Husky puppy has pretty much reached adult height. From there on the muscle mass bulks up a bit, thanks to exercise and diet, to reach adult weight. If on your dog's first birthday they are over the adult weights then there is a chance your Husky is overweight and this should be attended to before the condition worsens. Under a year old the dog is growing quite fast, and like humans dogs are a little inconsistent in when growth spurts will happen, so it can be difficult to suggest an ideal weight range. However it is generally regarded that at 12 weeks of age (3 months) the husky will be about half of adult weight. The average weight of male siberian huskies will be around 23-30 pounds (10 - 14kg) and average weight of female huskies will be 18 to 30 pounds (8 to 11kg). 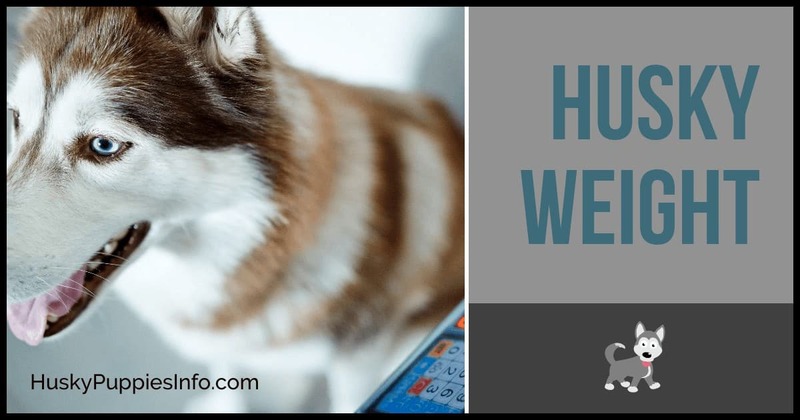 If we want to talk about younger than 3 months (but not much) we can say that an 8 week old male husky will weigh around 10 - 15 pounds (4.5 - 6.8 kg) and a female will weigh roughly 8 - 12 pounds (3.5 - 5.5 kg). And if we are talking about a miniature husky, then that is a totally different topic. Is My Husky Fat (Overweight)? A rule of thumb to determine an overweight dog is to look top-down and compare their waist to their chest. If the waist is wider than the chest then there is a chance the dog is carrying a little more weight than it should. What can you do about a fat husky? If you are feeding them a lot of snacks and treats you might want to cut back a bit. Feeding your husky puppy less human food and instead good quality dog food is the way to go. Food scraps from your own dinner might be higher in fats than what your dog requires. Dog food tends to be higher in protein to more accurately represent a traditional animal diet, promote muscle growth and not fat storage. You should also consider the amount of exercise you are giving your puppy. A slight increase in exercise, duration and/or intensity, might be enough to help the dog fall slowly to a more reasonable weight. Be gentle though - an overweight dog isn't going to be as strong, agile, or have the same stamina as a perfectly healthy dog. The tell-tale sign that a dog is underweight is that the rib bones are clearly visible across the chest. In this case similar advice applies for an overweight dog - look at the diet and feed more wholesome pet food with a high protein component. A bit more exercise can help promote muscle growth. If you suspect something else is at play - for example your puppy refuses to eat - definitely get it checked out by your vet. There could be an underlying health condition affecting appetite that needs to be treated. Slight variances from the Siberian Husky breed standard are to be expected while a husky puppy is growing. At 12 weeks you expect a husky to be about half adult weight, and by 12 months well on its way to reaching adult weight. Over- or under-weight dogs should be cared for with an improvement in diet and exercise. Of course, if you are concerned about the health of your puppy a trip to the vet is warranted. Catching problems early on can avoid more costly vet bills later, not to mention the more difficult to change your puppy's eating and exercise habits. A genuine husky lover who enjoys spending time with his huskies. Huskypuppiesinfo.com was created purely out of passion for these dogs.